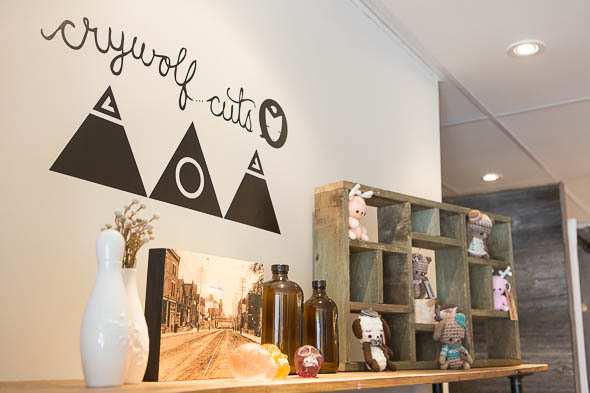 Crywolf is a boutique on Ossington with a down-to-earth vibe and a fun spirit. 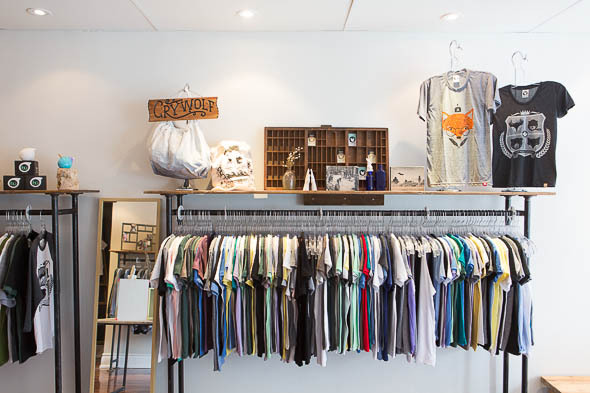 Owners Rose Chang and Stephanie Drabik operate as a total team effort, sharing the responsibilities for managing the business and designing the t-shirts and other unique treats emblazoned with their quirky characters. 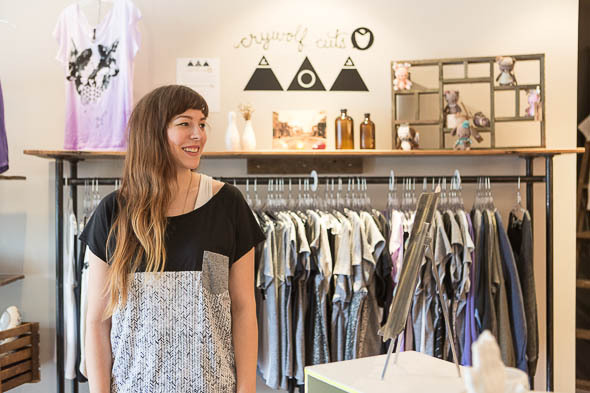 The two met in high school, and they started collaborating while they were in university (Chang went to U of T, while Drabik went to OCAD) and started up their first screenprinting company, p0isson, which evolved into Crywolf back in 2008 . The ladies decided it was finally time to "go big or go home," according to Drabik. 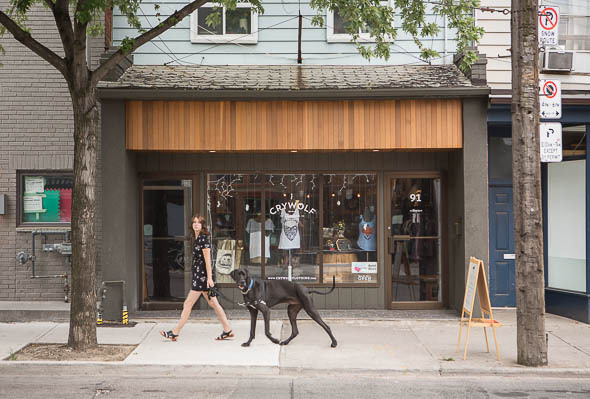 So, they went big a couple of weeks ago, opening up shop on Ossington between Queen and Dundas. I pop into the shop on a Wednesday afternoon, and it's all I can do to steal a few minutes with the designers. People are shopping around, asking about custom projects and chatting them up. Wandering around the shop I spot several fantastic items, like a turquoise tee with a drugged-looking cat on it and a banner that says "party," ($28) and a tank with a monstrous-looking unicorn ($35). 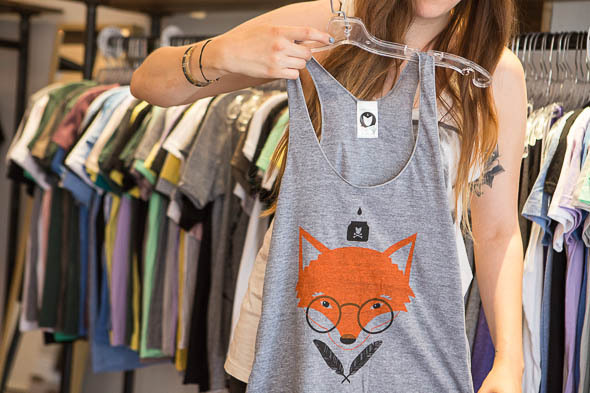 True to their roots, tees are crywolf's specialty, with fox and, of course, wolf prints aplenty. But it's not just t-shirts with typical shapes and textures you'd expect with Chang and Drabik. They also make sweatshirty options from dark heather grey cotton, embellished with white cotton paneling and front pockets. Options like these show the ladies behind Crywolf are not only screen printers, but true designers, as well. They've also designed silver-plated charms ($25), in case you feel the need to always be accompanied by a teensy ice cream cone, pug or T-Rex. 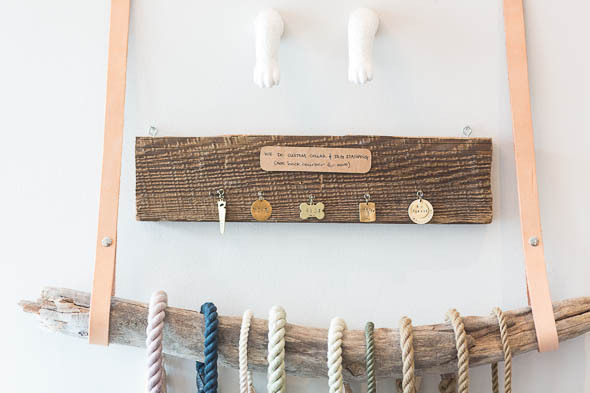 They do custom-stamped dog tags, too, which are really pretty and trendy and just as wearable for people as they are for pups. And for fans of flair, they do up giant buttons emblazoned with their designs for $3. 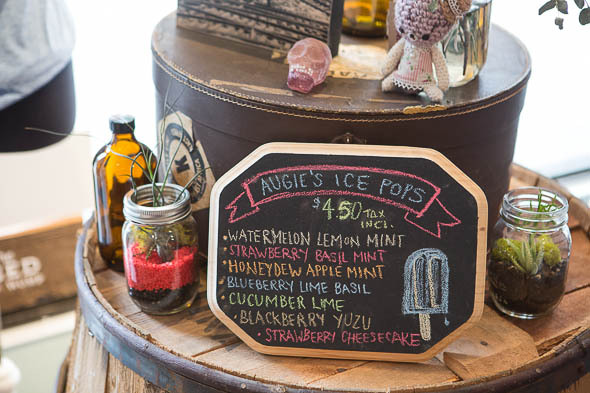 Aside from their own designs, Crywolf carries goods from other great Toronto brands, like Augie's gourmet ice pops and painted antler keychains from by North . If you're interested in the brand and want to support it, Chang and Drabik are using Indiegogo to raise more money and continue to finance the store a little bit more. The campaign will run until the end of August, and with donations come sweet limited-edition tees and silk screens, some by Crywolf and some featuring art done in collaboration with local designers Nik Dudukovic and Chris Cresswell. If you're an art geek and want to get your karma on, maybe pop on by the shop and think about donating.